The Make-A-Wish Foundation is a non-profit organization founded in the United States that arranges experiences described as "wishes" to children with life-threatening medical conditions. Vision: To grant the wish of every eligible child. Child Focus: We always put wish children first. Integrity: We are honest, transparent and respectful. Impact: We deliver life-changing work. Innovation: We are bold, imaginative and creative. Community: We are a diverse group of people working together towards a common goal. Values: Our values serve as the map to attain our vision of granting the wish of every eligible child. They are a clear guide to our priorities and lead the way in everything we do. Make-A-Wish is one of the world's leading children's charities. After the start of Make-A-Wish in the United States, interest in granting the wishes of children with life-threatening medical conditions quickly spread to other nations. In 1993, Make-A-Wish International was officially formed to serve five countries outside the U.S. - and now helps to serve children outside the United States in more than 50 countries on five continents through its 41 affiliates. Make-A-Wish America grants the wishes of children in the United States through its 62 chapters. With the help of generous donors and over 40,000 volunteers, Make-A-Wish has collectively granted approximately nearly 450,000 wishes worldwide since 1980. 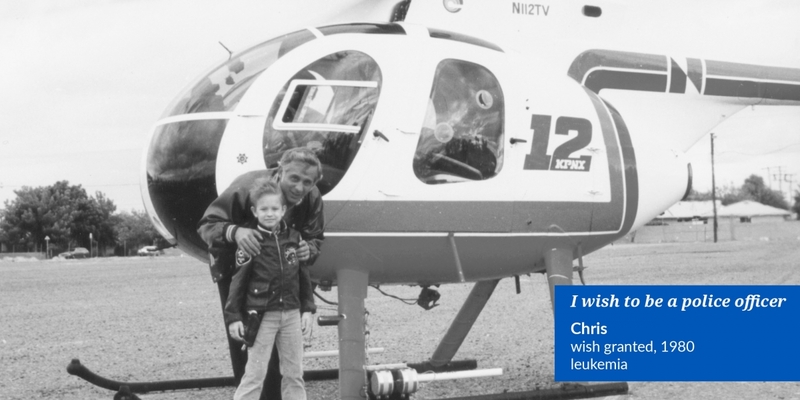 The creation of Make-A-Wish was inspired in the U.S. in 1980 by the fulfillment of a single wish of a 7-year-old boy with leukemia named Chris Greicius, who wished to be a policeman. His mother, several friends and a group of police officers, with the cooperation of the Arizona Department of Public Safety, granted his wish with a custom-made uniform, helmet, badge, and helicopter ride! After the wish, those involved were inspired and eager to bring that same hope, strength, and joy they saw as a result of Chris’ wish, to more children. Their simple idea has led to the continued growth of the world’s largest wish-granting organization, now operating in more than 50 countries. The magical relationship Make-A-Wish has formed with Disney® on a global scale began with Frank "Bopsy" Salazar, the first official wish child of Make-A-Wish. Like Chris, he was a 7-year-old boy in the U.S. who was diagnosed with leukemia and revered people in uniform. Make-A-Wish set out to grant his wish to be a firefighter, and thanks to incredible support from our Disney friends, more fun was in store for his magical wish when he became the first of a long history of wish children to visit a Disney Theme Park. Every unforgettable wish granted by Make-A-Wish is funded by generous donors and sponsors. They help us bring hope, strength, and joy to every eligible child, and accomplish our mission. Make-A-Wish is very proud to have the support and generosity of businesses ranging from family-owned local enterprises to some of the world’s largest corporations who recognize the importance of our foundation. We are grateful to our corporate partner Riginov, and we appreciate your support!